14.56 m/l acre parcel has over 2,880 lineal feet of frontage on Freeway 99 and is less than 1,000 feet from the Applegate exit from Freeway 99. Property is zoned B-P which allows for both commercial (i.e. retail / office) & industrial (i.e. shop /warehouse) usages. Atwater has an approved cannabis ordinance which also allows for the cultivation, manufacturing and distribution of cannabis products within the B-P zoning (See attached supplement). Buyer and Buyers Agent to confirm allowable usages with the City of Atwater. 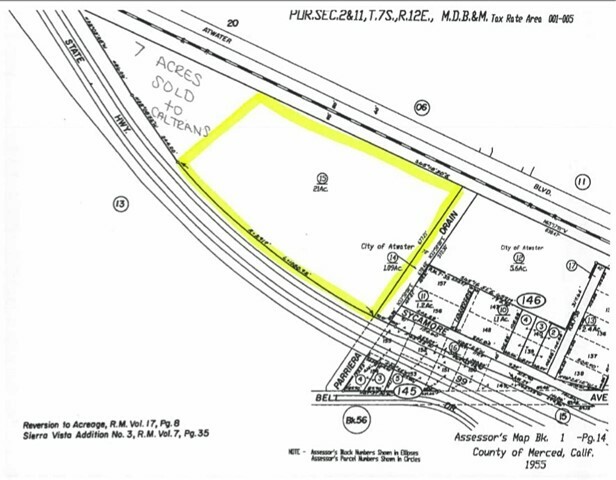 This highly flexible property sits at the west end of Sycamore Ave. which can be extended into the site. Seller may consider a lot split, a ground lease on all or a portion of the property, a build-to-suit for sale, all of which are subject to negotiating terms and conditions acceptable to Seller. Great location, only 1/2 mile from a major regional shopping center ancored by a Super Walmart, Super Target, Marshalls. etc. (i.e. Applegate Ranch) & within 3 miles from Castle Airport & Delvelopment Center an FAA approved airport with the sixth longest runway in the State.